An international research team, led by scientists at the National Institute of Standards and Technology's (NIST) Center for Nanoscale Science and Technology, has developed a technique for measuring crystal vibrations in graphene. In graphene, like in other crystals, when enough heat or other energy is applied, the forces that bond the atoms together cause the atoms to vibrate and spread the energy throughout the material. These vibrations, which have frequencies in the terahertz-range, are called phonons. Understanding phonon interactions can help gain knowledge on how to manipulate energy in a material, and can be crucial since learning effective ways to remove heat energy is vital to the continued miniaturization of electronics. Existing measuring systems can be complicated and not sensitive enough to the minimal signals that need to be detected. 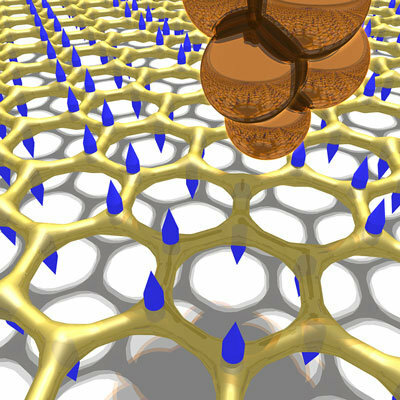 In order to filter the phonons' signal from other distractions, NIST researchers used their STM (scanning tunneling microscope) to alter the number of electrons moving through their graphene device. As the number of electrons were varied, the unwanted signals also varied in energy, but the phonons remained fixed at their characteristic frequency. Averaging the signals over the different electron concentrations diluted the annoying disturbances, but reinforced the phonon signals. The team was able to map all the graphene phonons this way, and their findings agreed well with their Georgia Tech collaborators' theoretical predictions. Also, the researchers found a surprising behaviour while learning to pick out the phonons' signal - an effect similar to resonance-induced effects seen in small molecules. They speculate that this could mean that the system—graphene and STM—is mimicking a giant molecule, but add that they still don't have a firm theoretical understanding of what's happening.